Steve Hart interviewed dozens of stars of the 60s, 70s and 80s during his time on WBEZ. To the left is an interview Steve did with Tony Curtis on April 16, 1983. 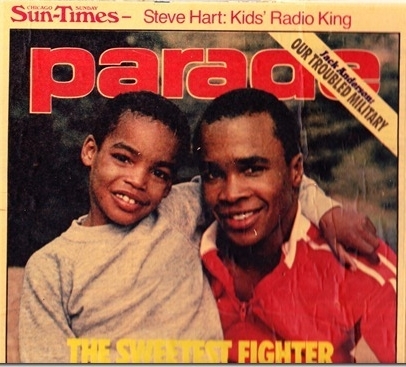 Read the story from Parade magazine below the video about Steve's time on WBEZ. 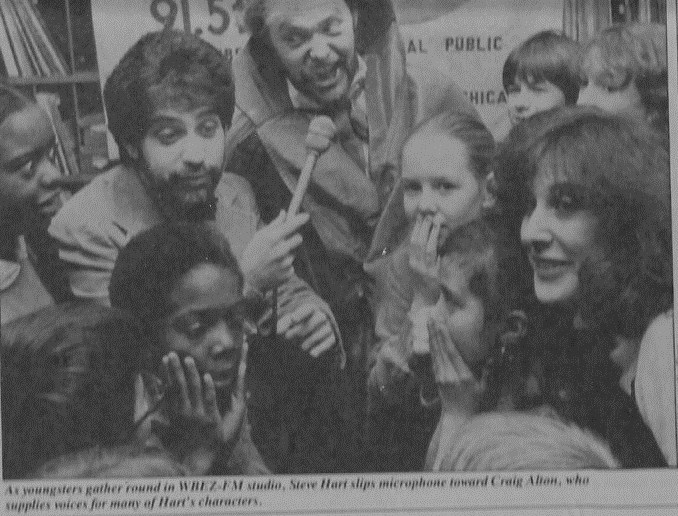 STEVE HART, THE KING OF RADIO to Chicago youngsters, beguiles his 200,000 pint-sized local listeners and National listeners far above the 200,000 people throughout the country that tuned in for two hours once a week on the Board of Education's FM station. His program, Audio Jam, features a special kind of zaniness, a gift for mimicry, a fondness for kids and an ability to get them to like him back. The show, which began last March, has grown so popular that public radio stations across the country signed on to broadcast it on Saturday mornings beginning Jan. 30. Audio Jam is a swirl of activity, and on it Hart fields phone calls from the children, conducts contests, interviews special guests-real and fictitious-and presents well over a dozen imaginative situations for them to follow. "Kids, we've got a full day today." He brays his words. "There are quizzes! There's fun! There's a spelling bee and an interview with a famous Chicagoan!" "Wait! I hear a knock at the door. Wonder who it is? Let's see..."
With a creak of the imaginary door, in walks Shirley Temple singing "On the Good Ship Lollipop." Because she intrudes habitually, Hart slams the door on Miss Temple. Then it's time for a few words with Aunt Edith and Uncle Morris, a couple based on Hart's real-life relatives and rendered out to radio land by the host himself. Aunt Edith is an assertive woman who invariably wants to go "shopping, shopping, and shopping." Uncle Morris is a grumpy fellow with the voice of a kazoo. Hart and his aunt and uncle ham it up for several minutes. He bids them adieu, hears another knock and says, "Now I wonder who this is?" It's Kate Smith, belting out "God Bless America". Hart flings the door closed to silence her. As the show proceeds, the special guests arrive. First up is Howie Sellsum, "the world's greatest salesperson", figuring out ways to peddle the city. Then there's Julia Smiles, a cooking teacher who has forgotten her piece of liver. Finally, in comes Mrs. O'Leary, blaming her husband for sparking the Chicago Fire. All are creations of Craig Alton, a voiceover artist who has teamed with Hart for a decade. At last, a real guest drops by-harmonica player Corky Siegel. After Hart and Corky attempt a duet of "Oh, Susannah", Siegel delivers the morning sermon: "Whatever you are doing, kids, enjoy it thoroughly. Don't worry about how good you are, or about how good somebody else is. Just enjoy." Local Audio Jam fans call Hart at the rate of 200 times per show. He spurs calls with come-ons like a spelling bee and a guessing game on individuals who have achieved national fame. Punctuating each call are tapes. Liberally used are renditions of the Mormon Tabernacle Choir singing the single word "Hallelujah" and a nasal voice exclaiming "Oh, phooey". "Erika, I've got to hang up on you", Steve tells his final phone caller. "I hate to, but you understand. Kids, I'll see you all next week, and for now this is Steve Hart, saying bye, bye, bye, bye." Hart's draw of 200,000 listeners pleases program director Jim Nayder, who says, "Before Audio Jam, we had so few people tuning in during its time slot, we didn't even register in the ratings book." Audio Jam will be underwritten by World Book Encyclopedia for the national market. Hart sees immense value in his show, especially in comparison with television: "I think that, for children, radio lends itself to participation. We offer the here and now; in other words, immediacy. If kids have a birthday, they can call up, and I'll personally wish them a happy birthday. That brings those kids an extra element of fun and excitement. Plus, kids catch mistakes made on my show. They see I'm not perfect. Look, in life, things go wrong. Take (the TV show) Captain Kangaroo, by comparison. It's perfect, which I mean as a compliment but also as a criticism. Kids use their imaginations listening to radio, and they get so much more. Say I need to depict an explosion. It runs me 2 cents to do what it takes thousands of dollars to do on TV, and the child is using his or her mind to visualize it." Beyond Audio Jam, WBEZ has also set up Hart with a Monday-morning workshop for Chicago public school students. In it, a dozen selected youngsters prepare segments for Hart's program. Among the workshop's productions were an open-ended Halloween story and a short drama describing the return of hotel man Potter Palmer to Graceland Cemetery, titled "Welcome Back, Potter". And he has a bird act-a Budgie Circus. As ringmaster, Hart delivers different types of shows. He stages an intimate event for birthday parties, another for, say, public libraries, and an extravaganza for college crowds, down to drum rolls. The Budgie Circus draws raves from its patrons. How did Hart become a circus master for a troupe of birds? "I was doing my puppet show at Lane Tech High School two years ago," he says, "and I was paired with a dog act. I saw this Chihuahua do a striptease. I had a couple of parakeets at home, and I thought. 'Why can't I do that with my birds?' It took me another year and a half before I bought a dozen new parakeets and started to train them." Some birds couldn't cut the mustard on Steve's 10-foot-high equipment, but the five who did made enough noise for a circus troupe. Among the stalwarts is Hercules, who wears a football helmet and rides a motorcycle, The Great Alfonso, a tightrope walker who favors sequined capes, and Steve's huge, green Gunther-Gebel Parrot. If Hart's Budgie Circus (budgie is short for budgerigar, the proper name for a parakeet) has a star, it's Madame Fifi. A white bird, unclothed for her performance, she caps the show by being tossed 30 feet into the hands of someone in the audience. "I remember walking into the studio on a Saturday morning and catching Hart doing his puppet show-on radio-if you can imagine that," recalls Nigut, now director of news operations at ABC-TV's Channel 7. "He'd be doing 14 different bits in 18 voices-and moving his dummies around too. His energy level was extraordinary." While Hart was growing up on the West Side and in Skokie, the son of a drive-in restaurant owner, his passion was puppetry, not radio. Hart kept a tribe of 10 puppets stashed in his bedroom, and after some ventriloquism lessons, he began performing at birthday parties. It was a sideline he kept at through his early adult years. But the puppetry, along with the program at WLTD, amounted strictly to moonlighting. Back then, Hart's main occupation was teaching. After college, he instructed emotionally disturbed youngsters in Wilmette, and then switched to the O.W. Wilson Occupational High School in Logan Square. There he taught the mildly retarded. "Steve was unusually creative," recalls Conrad M. DePaul, Employee Relations Coordinator for the Board of Education. DePaul was assistant principal at Wilson in those days. "He'd use ventriloquism in class, having his friends' ask the questions. It took the pressure off the kids. I kept an eye out for Steve, and when I noticed that the Board of Education had a teacher-writer opening, I encouraged him to apply." That was in 1972, and Steve was hired to create a sort of radio Sesame Street for WBEZ. He originated several shows that won national awards and still appear on the air, including a soap opera on oral hygiene called Tillie the Tooth and Science with the Count, an adaptation of the Dracula legend. Another show, Lollypops and Stuff, featured youngsters reporting the news. 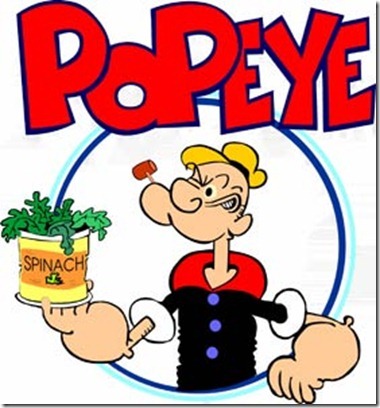 After his WLTD program folded, Hart spent four years as the majordomo of Popeye with Steve Hart on Channel 44. It was an extra job he relished. Wearing a sailor suit, he introduced cartoons with the help of Hector the Chicken and Little K-a pug-nosed puppet in a derby hat, named for the program's longtime sponsor, the manufacturers of Kayo chocolate drink. 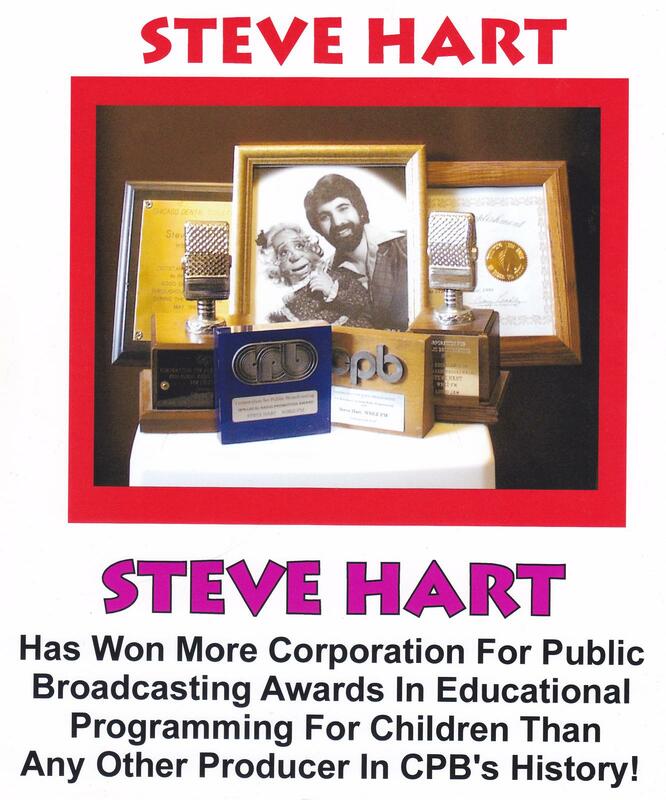 "Popeye with Steve Hart Is on every weekday in the late afternoon, and I became very popular," remembers Hart. "But it got so I couldn't go to McDonald's with my two girls without being hassled, and it grew hard to sell the show to advertisers." So he quit. If Hart misses getting his face-along with his voice-before an audience, he doesn't admit it. He says he is extremely content with his work, wherever the national airing of his program may lead. "I can't complain," he reflects. "You know, I used to fantasize about having my own radio show, and I've had that. I've always had enough money for my family. "I love working with kids. They're terrific. Adults are just older kids. If you observe children on any playground and then observe adults, you'll see the kids acting in exactly the same way, only on a lower level. They're gossips, they're friendly, and they're sometimes hostile. Why, it's just like in any office."